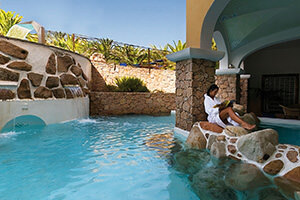 Find your oasis of wellness and relaxation among the elegant SPAs at Delphina hotels and resorts in Sardinia. Discover the six Delphina wellness centres. From the Costa Smeralda to the Golfo dell’Asinara, there are six destinations for rejuvenating holidays among the Mediterranean scents and perfumes, all overlooking the crystal-clear waters of North Sardinia. 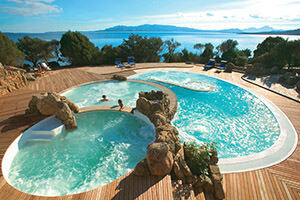 You can spend a wellness holiday in Sardinia at the Delphina hotels and resorts Spas and Thalassotherapy centres. Secret gardens enveloped in the typical colours and fragrances of the island where the scents become the “secret” ingredient of the treatments on offer and nature is a delicate balm for the soul. Choose the wellness centre you most prefer and discover the SPA package that is best for you! 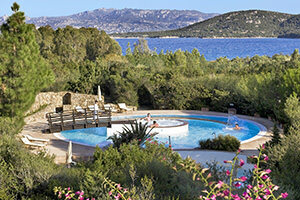 L’Incantu is the wellness and relaxation jewel in the crown of the 5 star Hotel Capo d’Orso in Palau. Like the boutique hotel in which it is set, the SPA is an intimate and welcoming oasis just a few metres from the sea with chalets offering breathtaking views and gazebos immersed in luxuriant greenery offering you unforgettable open-air massages. Truly enchanting. In the heart of the 5 star Resort Valle dell’Erica near Santa Teresa Gallura, Le Thermae is a spectacular Thalasso Centre in a beautiful natural setting with imposing granite rocks. The view over the islands of the La Maddalena Archipelago and the spa’s exclusive treatments make it a genuine dream destination. 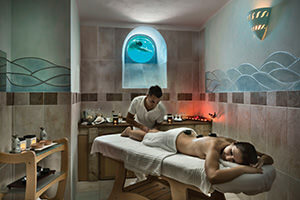 2,500 square metres dedicated to Thalassotherapy and beauty. The Elicriso Wellness Centre at the 5 star Hotel Marinedda at Isola Rossa is the perfect place to immerse yourself in the heated seawater pools and feel rejuvenated at the hands of our attentive and experienced staff. Venere is the delightful yet intimate Thalasso Centre at the 4 star Hotel Relax Torreruja at Isola Rossa which is perfect for couples. The elegant chalets for massages as a couple together with a Jacuzzi for two will guarantee you romantic moments to enjoy and share with your partner. 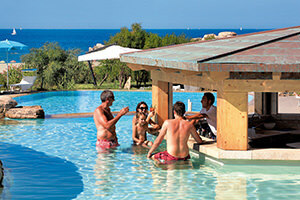 The Sabine is the Wellness Centre at the 4 star Le Dune Resort in Badesi. Set among sand dunes and centuries-old juniper trees, it is the perfect place to enjoy peace and relaxation amidst heated fresh water pools and treatments in elegant and welcoming chalets. The d’Ea Marina Wellness Centre at the Hotel Cala di Lepre in Palau is the ideal setting in which to enjoy sardinian nature to the full. The aromas and lively Mediterranean colours will put new life into your body and soul as you enjoy the pools with their heated seawater. Discover the benefits of seawater during your holiday in Sardinia where you can spend endless moments of pleasure and relaxation.